Karl Watson, Paul Weitman and Mike Pegram's McKinzie began 2018 as Bob Baffert's leading prospect for the Grade 1 Kentucky Derby, but injury forced the Street Sense colt to the sidelines while Baffert stablemate Justify made his unbeaten run through the Triple Crown. 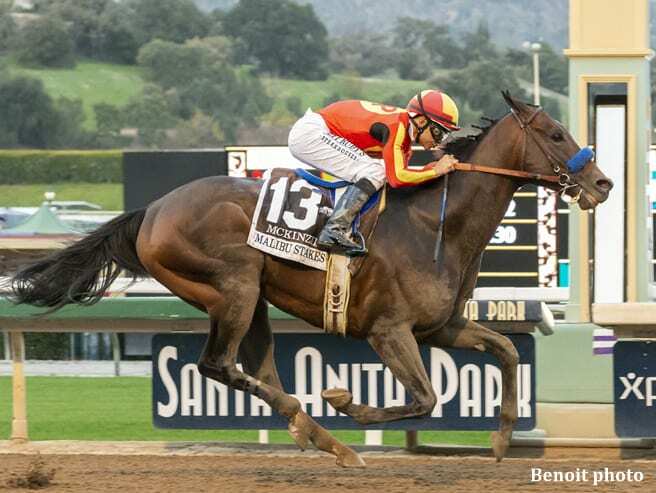 McKinzie ended the year with an overpowering 4 3/4-length victory in the Grade 1 Malibu before a crowd of 41,373 on Santa Anita's opening day program Wednesday, giving the Hall of Fame trainer a strong hand in upcoming races for older horses in 2019. Under Hall of Fame jockey Mike Smith, McKinzie came from well off the pace to crush his 13 rivals in the $300,000 Malibu, drawing off with authority as the 6-5 favorite, paying $4.40. Chad Brown-trained Identity Politics, making his stakes debut, finished second, with another East Coast shipper, Timothy Keefe-trained Still Having Fun and Michael McCarthy-trained Axelrod fourth. McKinzie, bred in Kentucky by Summer Wind Farm and purchased in the name of Three Amigos at the Keeneland September Yearling Sale for $170,000, covered seven furlongs on a fast track in 1:22.48. Long shot Calexman, ridden by Geovanni Franco, shot to the front of the crowded field in the Malibu, leading the way through fractions of :22.30 and :44.92. Nero, one of four Baffert trainees in the race, was in closest pursuit under Joe Talamo, with Still Having Fun and Ax Man right behind him. McKinzie, who broke from the 13 post, was kept wide and in the clear by Smith but was in 10th position in the early stages. Smith began to ask McKinzie entering the far turn, swung the colt wide into the stretch and took command inside the furlong pole after stopping the clock in 1:09.97 for six furlongs. He drew off from there with authority while Identity Politics won a five-horse scramble for second place. The victory was the fifth in seven career starts for McKinzie, named for the late Los Alamitos racing executive, Brad McKinzie, whose friendship with Baffert and Pegram goes back to the latter pair's days in the Quarter Horse business at the Orange County, Calif., track where McKinzie worked. McKinzie was coming off a 12th-place finish in the G1 Breeders' Cup Classic at Churchill Downs on Nov. 3, a race Baffert would say was a mistake for the colt to run in after having just one prep, a victory in the G1 Pennsylvania Derby at Parx Sept. 22. McKinzie was sidelined from March until the Pennsylvania Derby with a hock injury. Before that, he won the G1 Los Alamitos Futurity via disqualification of Baffert stablemate Solomini as a 2-year-old, won the G3 Sham Stakes in January, then finished first but was disqualified and placed second in the G2 San Felipe March 10. Total wagering on the opening day 10-race program was $20,491,016, according to Equibase. That eclipses the previous opening day record of $19,004,625 set in 2005. Wagering on last year's nine-race card was $17,279,162. This entry was posted in NL Article, Racing and tagged Bob Baffert, Brad McKinzie, identity politics, Malibu Stakes, mckinzie, santa anita, Santa Anita opening day, still having fun by Paulick Report Staff. Bookmark the permalink.